Unlike the Straits Chinese communities in Penang, Melaka and SIngapore which seek to create their own unique identity that differentiates them from the early local Chinese communities as well as the local Malays and indigenous folks, otherwise more commonly known as the “bumiputeras”, the Kelantanese Peranakans lived alongside Malays adopting the latter’s ways of life and become successfully integrated in it. Calling themselves “kampung cina” (village Chinese), the Kelantanese Peranakans seem categorically dissimilar from the “bandar cina” (Town Cina) with the latter group settling in Kelantan much later than the Peranakans. This is echoed in the historical segregation of “baba-nyonyas” versus “sinkehs” in Penang, Melaka and SIngapore. However unlike the Peranakans in these strongholds, the Kelantanese Peranakans do not set themselves apart from the Malays. They do not resonate much to the notion of being “Peranakan”, which is no more than a label which had been “officially” assigned to them. Creating a label is one thing, imbuing a sense of ownership and identity is another. Here are some interesting websites on Kelantanese Peranakans which some of you may find interesting. I most certainly did when i first read them from the links provided alongside the recipe for Telur Kesum on Wendy’s blog. The recipe is simple to follow but calls for quite a number of ingredients. Thankfully I have all of them at home. The flavours of the dish are rather unique. 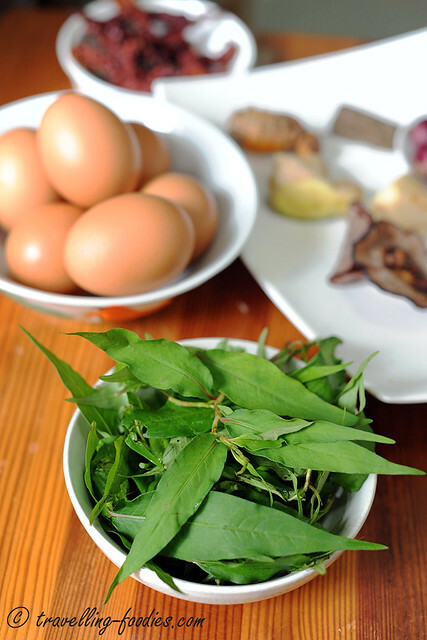 the gravy which thickened with a beaten egg, highly perfumed by the wafts of herby aroma through the use of Vietnamese coriander which is known local as “daun kesum” that gives rise to the name of the dish. Traditionally, budu, a fish sauce made from fermented anchovies is used but typical Thai or even Vietnamese fish sauce is an acceptable substitute and lends a lovely umami to the eggs making them morerish! As with many traditional dishes of Peranakan or Malay origins, the taste is multi-faceted owing to the ingredients used, literally a melting pot of flavours. 4-6 sprigs of Vietnamese mint aka daun kesum leaves only, julienned finely. 1. Heat wok on medium heat and put in oil, saute the paste until fragrant. 2. Put in water, asam gelugor,Vietnamese mint and coconut milk. Bring it to a boil and reduce to low heat. 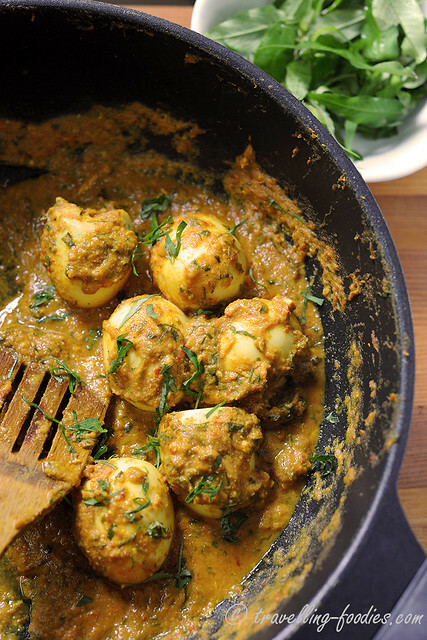 While waiting for the ingredients to come to a boil, crack raw egg into bowl and beat slightly to break the yolk. Pour beaten egg and quickly but gently stir it around. This tempers the egg into the sauce without causing it to curdle. Let the gravy simmer for 5 min. 3. Meanwhile, prick each hardboiled egg with a toothpick. This allows the sauce to penetrate into the eggs and not merely just coating the surface, thus allowing the flavours to permeate. 4. 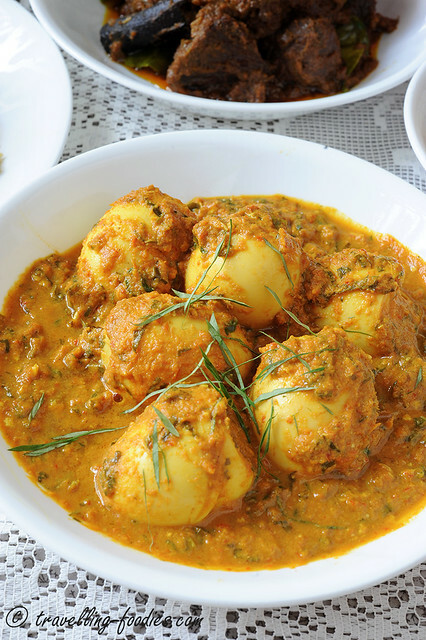 Add hard boiled eggs to the gravy as well as chopped gula melaka. Let it simmer for another 5 minutes on low heat. 5. Season with fish sauce. Taste and adjust with more fish sauce or gula melaka. This entry was posted on August 7, 2013 by Alan (travellingfoodies). It was filed under Food, Simple Eats and was tagged with asam keping, bawang merah, belacan, budu. 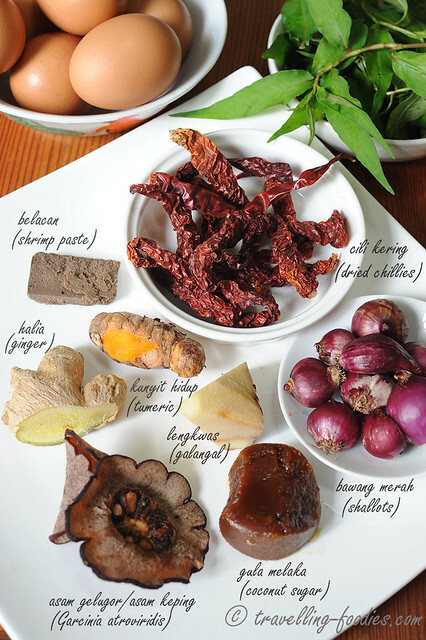 asam gelugor, cili kering, daon kesom, daun kesum, egg, fish sauce, galangal, Kelantan Telur Kesum, kunyit, lengkwas, telor, telur, tumeric, vietnamese coriander. oh I wish I am not so intimidated by the process for this dish looks really good with rice! Beautiful shots of the dish, Alan! Looks delicious too! 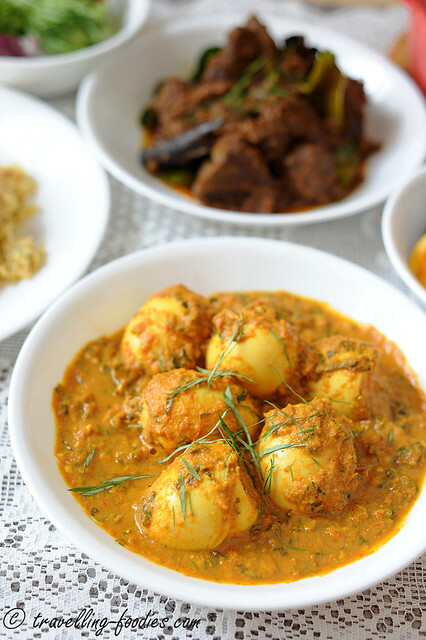 You have made cooking an art… Your egg curry is beautiful and love how you showed us how you cooked it. I like to call you, Alan the food artistic! Very appetizing! Need extra rice. Interesting findings. Thanks for sharing. I have always wonder how will the influence of Peranakan cuisine goes besides Melaka, Penang and Singapore.